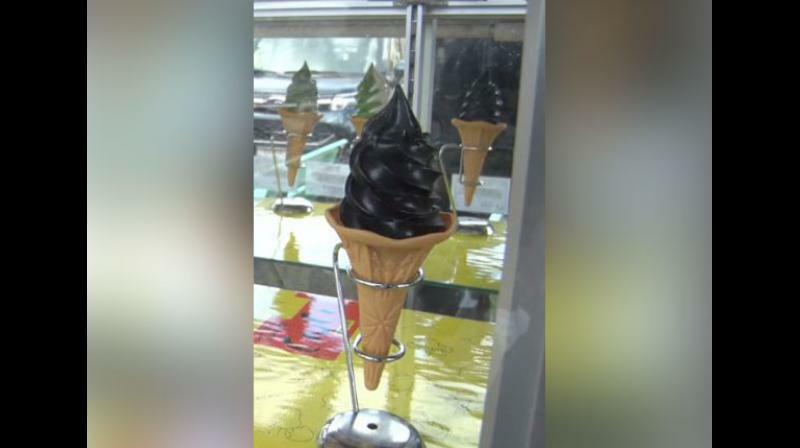 Yaizu (Japan): Fish Town food market in Yaizu City of Japan has caught the attention of both locals and tourists with its black coloured ‘squid ink’ ice cream. Famous for its seafood and green tea, the market is usually packed with customers, indulging in the local delicacies. The place has especially observed an increase in the number of residents and tourists after this unique ice cream was introduced. While Japan is presently experiencing winter season, the chilly climate has not stopped customers from coming to this ice cream shop, located just outside the market. Reflecting on the unique experience, one of the visitors stated that the spicy squid ink and wasabi flavour turns a person's mouth black. Explaining the concept behind the unique ice cream, Kazunori Ooishi of Soft Ice cream Shop said, "Soft ice cream is usually white in colour and comes in vanilla flavour. But this is exactly opposite of that. This ice cream is black in colour and represents the image of a fish town. This is why we came up with a combination of the blackness of squid ink and vanilla flavour. It was not easy to come up with this tasty flavour”. Apart from the black ice cream, the shop also features soft ice cream in classic flavours including vanilla, chocolate and strawberry.